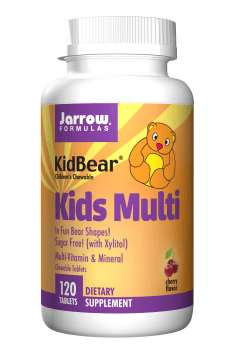 Jarrow Kids Multi is a dietary supplement containing a concentrated dose of vitamins and minerals, supporting healthy development of children and youth (2 – 12 years old). The preparation does not contain colorings, sugar or other additives. For the first years of life, the organism of a child is intensively developing, thanks to which it needs a large dose of energy and all the necessary nutrients. Improper diet in the period of growth and development of the organism may negatively influence not only well-being, and state of health in childhood and adolescence, but it may also contribute to serious consequences in adulthood. The preparation contains an optimal dose of highly assimilable ingredients and minerals, which support the organism in this special period and help to increase natural immunity. al metabolic processes. They play a function of biochemical catalysts and are the components of numerous enzymes. Vitamin A is essential for the proper functioning of eyesight, skin and the immune system. Vitamin E demonstrates strong antioxidant properties and its deficiency may be the cause of lower concentration and weaker immunity. Vitamin E and vitamin A are considered to be one of the elements of the first defense line against free radicals. Vitamin D conditions the health of the skeletal system, supports proper growth and counteracts rickets in children. Vitamin C stimulates the production of collagen, helps to maintain proper state of skin and mucous membranes and also increases immunity of cells to infections and damages. The preparation also contains the complex of B-group vitamins – riboflavin (vitamin B2), thiamin (vitamin B1), niacin (vitamin B3), pyridoxin (vitamin B6), biotin (B7), pantothenic acid (B5), cobalamin (B12) and folates. Vitamins from this group are mainly responsible for the health of the nervous system. They stabilize well-being and improve memory and concentration and their deficiency may be the cause of worse mood, neurosis or even depression. In case of vitamin B12 and folate, a methylated form was used, which supports methylation processes, consisting in passing methyl group –CH3 between molecules and then binding them with the enzyme responsible for a given biological function. Problems with methylation may lead to disorders in the biosynthesis of neurotransmitters, improper detoxification and the development of inflammations and cardiovascular diseases. Supplementation of the methylated form of folic acid may decrease high level of homocysteine – an amino acid appearing in blood, which is related to damages of blood vessels and atherosclerosis and increases the risk of heart attack and stroke. ssential to ensure well-being and health. Calcium and magnesium constitute building material for bones, teeth, skin and hair. Their deficiency may be the cause of their decreased mineral density and increase the risk of rickets. Magnesium takes part in the production of highly energetic compounds storing energy, alleviates stress and influences proper work of the nervous system. Potassium plays a key role in water-electrolyte balance and maintaining proper acid-base balance and it also influences nerve-muscle excitability. Iodine takes part in the production of thyroid hormones, which play a key role i.a. in the proper development of the nervous system and the functioning of the brain. Iodine deficiency is related to disorders of memory and intellectual efficiency, decreased energy level and higher susceptibility to infections. Selenium, similarly to iodine takes part in the synthesis of thyroid hormones and strengthens the immune system. Manganese takes part in the synthesis of nucleic acid and proteins. Chromium improves metabolism of glucose and carbohydrate tolerance. Additionally, there is lutein in the preparation, which has antioxidant properties and supports vision in the protection from dangerous UV radiation and grape skin extract containing proanthocyanidins with strong antioxidant effect. To sum up, Jarrow Kids Multi is a dietary supplement, ideally suited to the needs of children, which helps to complement a diet in essential ingredients and minerals. The preparation is recommended especially in the period of increased physical and mental effort and decreased immunity. Childhood is one of the most important periods in life. During this time, the most intensive development of all systems of the organism takes place and shaping of natural defense mechanisms. Contrary to appearances, not only adults are prone to stress – children and youngsters also experience stressful situations. First day at school or kindergarten, homework, tests, new acquaintances may be the cause of stress and in turn it may lead to lack of appetite, excessive deficiency of nutrients and lower immunity, therefore it is worth taking a multi-ingredient preparation, which will not only support the proper development of a young organism, but it will also support defense mechanisms.